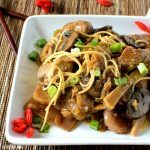 A delicious Chinese-American recipe that utilizes whichever meat you prefer along with bean sprouts, bamboo shoots, water chestnuts, onions, and celery. Add more vegetables if you wish. 4 oz. Canton noodles cooked according to directions. Set aside. Heat 2 tablespoons of olive oil in large skillet over medium heat and add the pork cubes. Cook, stirring, until the pork begins to brown, 10 minutes. Remove the meat from the skillet and set aside. Heat the remaining oil in the skillet and add the onion, celery, and red pepper flakes. Sauté for about 2 to 3 minutes. Add the mushrooms and continue to sauté until the mushrooms release some of their liquid about another 3 minutes. Stir in the bean sprouts, bamboo shoots, water chestnuts, and chicken broth. Let it come to a simmer. Add the meat back in with the soy sauce and cover the skillet. Let it simmer for about 5 minutes. In a small bowl or measuring cup combine the cold water with the cornstarch. Stir the slurry into the skillet mixture. Cook for about 5 minutes or until thickened. Add the canton noodles to the shop suey and stir until thoroughly combined. This is virtually a basic recipe you can add as many vegetables as you want. The meat is up to you -- pork, beef, or chicken.